Who Sets the Vision & Goals for Getting There in the Church? Sometimes leaders alone set the vision for the church and then expect people to joyfully and wholeheartedly implement the goals to get there. Reality, however, may pose a different scenario … difficulty getting people on board with the vision, hard time recruiting people to accomplish the goals, insufficient giving to move forward. Read the Body Life section on this website and you’ll find three important elements to take into consideration in any task a church leader seeks to accomplish, including who sets the vision and goals to get there. Ephesians 4:16 reminds us that everybody has a part. Often we look at that in terms of people “doing” their part. Perhaps we need to take a step back to think about the part people should have in providing input. 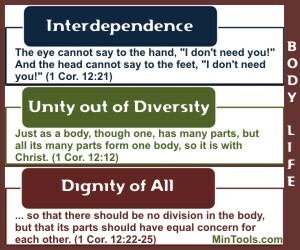 Also look at 1 Corinthians 12:21 — “The eye cannot say to the hand, “I don’t need you!” And the head cannot say to the feet, “I don’t need you!” — The hands that “do” need the eyes that see. The feet that go need the head that thinks or analyzes the steps to take. We need each other. When we fail to look to others for input, it’s like we’re saying we don’t trust them, that only we can grasp God’s vision for the Body. Where is the biblical basis for that line of thinking? One of the reasons we need each other is that we bring different perspectives to the table. When we pull together the input of a variety of people, we tend to arrive at a better conclusion than if we determined it on our own. We need to get beyond power struggles to do things “my” way and not feel threatened by opposing views. We need to value the input of others in the Body. When people have opportunity to provide input, they tend to develop an ownership of the vision and goals for getting there. And, then they tend to be more joyful and wholehearted in implementing those goals. As leaders, we must guard against feeling and acting like our position gives us the edge and the right to control people. Jesus said, “The kings of the Gentiles lord it over them; and those who exercise authority over them call themselves Benefactors. But you are not to be like that. Instead, the greatest among you should be like the youngest, and the one who rules like the one who serves” (Lk. 22:25-26). As leaders we set the example, like Jesus did, in serving among, not over. We aren’t going to do that if we think less of other people’s input because they aren’t in a leadership position. Rather, we need to respect and value everyone, which also includes their input.